14 year-old Ben Johnston is bright, quirky and impulsive. He is bored by life in the small coastal town of Werrinup where the only excitement is when his very organised, ironing-is-a-lost-art-form mother forgets to check his homework. But when he thinks he's on the trail of the Werrinup Thief he stumbles into a mystery as big as the Universe. Ben thinks he has identified the culprit as his best buddy Francis and, in hot pursuit, he follows Francis through a storm drain. On the other side he finds himself in unfamiliar territory but is distracted by the pursuit of Francis.The Thief gives Ben the slip. Ben is on the way home (he thinks) when he comes across a beautiful girl, a year or so older. As soon as they're close together, huge purple bugs swoop to attack them. The bugs are about 20 cm long with three-fanged snake heads dragon-fly wings and a mean attitude. But a woman stands waiting. With Ninja-like moves and a kind of laser-shooting wand she zaps the bugs and is gone. Ben is astonished when he recognises that the woman was his mother, Veronica. Ben finds he's in another Werrinup, similar but different. In his confusion re Francis he does not notice the changes until he reaches his house where Ben finds his bedroom is occupied by the girl he's just seen, Katherine. The impulsive Ben and the sharp, logical Katherine are instantly at odds. And neither can explain why they live in versions of the same house nor why Katherine's long lost mother is Ben's mother, Veronica. In fact while the two Werrinups look alike in many respects in this second Werrinup "Law and Order" is the message for the day. The streetscape is dominated by "No" signs (as in "No Fishing", "No Walking on the Grass" etc) and the local Mrs Dunkly, a hard-dealing shop owner in Ben's Werrinup, is a haughty, conniving real estate agent in Katherine's world. In short Katherine's Werrinup is a regimented place and Ben soon falls foul of the rules. He is about to be carted off to jail when Francis Thief sneaks him away. After his escape Katherine follows Ben into his world. Their appearance together triggers another purple bug attack and Veronica fends them off, identifying them as 'welkin'. Ben and Katherine realise they live in parallel worlds and that Francis Thief, a doppelganger of Ben's friend, visits from yet a third world. But how and why is a mystery — and so is their mother. All Veronica will tell them is that thousands of worlds are being destroyed and that they mustn't risk being in the same one at the same time. His mother has some explaining to do but Ben sure isn't bored any more. In Ben's World, Ben learns from Veronica that she's a Guardian — a defender of the worlds in the parallel universes that make up the Parallax. The bugs she fought off are called welkin and the 'wand' she used is her Stave. Jeremy, her partner and Ben's father, doesn't know any of this — and it must remain a secret from him. In Katherine's World, Katherine has confided to her best friend Melinda that her mother Veronica is alive and living in another Werrinup. Ben, 'borrowing' his mother's Stave to fend off welkin, ventures again into Katherine's World but proves no master of the gadget when welkin again attack him & Katherine. But with timing and courage Ben defeats the welkin and the kids discover that they can be destroyed with water. Ben stays behind while Katherine goes to Ben's World and demands to know why Veronica abandoned her as a child. Again Veronica ducks the question. Meanwhile the Raddic home is under threat. Mrs Dunkly (who is a wannabe a real estate mogul in this world), and her aggressive son Martin are threatening Katherine's father, Stefan, with instant foreclosure and demolition. Ben remembers that a period drawing was found back in the house in his world. While Ben helps Stefan hold the bulldozers at bay Melinda goes through the portal to Ben's World and brings back the picture just in time for Katherine to trade it off and save the house. But when he gets home Veronica is annoyed that he's ventured into Katherine's World again and — worse — that he's taken the Stave and lost it. Neither of them knows that Francis Thief has picked it up. 'Francis Thief" dropping in on Ben's World, pays out on the local Martin for making fun of Ben. The intruder "borrows" Martin's clothes leaving him naked at the swimming pool. 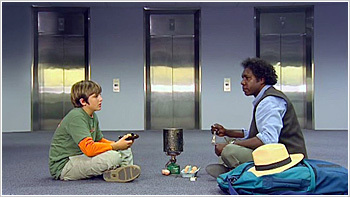 Ben must get the stuff back, especially a valuable MP3 player, or his friend, the local Francis, will get the blame. Discovering, in the library of Katherine's World, a portal to the 'thief's' world, Ben follows him through and discovers a laid back "Hippie" Werrinup. BEN gets the MP3 back and together the two Francises work a scam, appearing to be in two places once. Martin is discredited: the Local Francis is off the hook. But, scavenging in Katherine's World, 'Francis Thief' is spotted by that Martin and, fleeing, Francis loses the Stave. Martin, intrigued by the strange object, experiments and finds that it emits destructive blasts and fires missile balls which cause havoc in his mother's real estate office. Veronica secretly accompanies Katherine back to her world is search of the Stave. With Melinda's help and some fast talking they bargain it back from Martin. Katherine has many more questions for Veronica. Her mother says she had to abandon Katherine and her father. She and Katherine are both Guardians, and, together, their blood/smell attracts the welkin. But Katherine is logical, pedantic AND determined. She cross-examines Veronica: wouldn't the same be true of Veronica and Ben? Why would Ben's world be any safer? Veronica is evasive: it's to do with Katherine and Ben's joint power as Guardians and, make no mistake, there's a war on. She dodges further questions, leaving Katherine unsatisfied and suspicious. Throughout the Parallax, people have love on their minds. Katherine is scheming to reunite Stefan and Veronica. In Ben's world, his best friend Francis is enamoured with Julia, an exchange student. At the same time, both Ben and Martin are vying for the attentions of the local Melinda. Ben gets caught in the centre when Katherine visits. She suggests a challenge to Martin: if Ben can organise a 1950s rock'n'roll dance that rocks, Martin has to leave the local Melinda alone. If the dance is a flop, Ben has to stay away from her. Ben suddenly finds himself in charge of organising a huge dance for the coming Saturday night. His dad Jeremy offers to organise the band, and Veronica gives him a hand setting the hall up. But things move into dangerous territory when Ben realises that Katherine and Melinda are planning to attend. The girls suggest that everyone wear masks, to conceal their identities. Its part of Katherine's plan to convince Stefan to come to a secret dance: they will blindfold him so that he doesn't realise he's been led through a portal into the other Werrinup. The big night has arrived, with a big problem: the band's vocalist, is AWOL. Francis Thief disappears and returns with the King of Rock'n'Roll, a familiar figure who isn't dead, but has been fishing in Hippie World for the last few years. With such a brilliant singer, the night really takes off and everyone is having a great time. Francis Thief gives his doppelganger a helping hand and the two boys take it in turns to dance with Julia, who can dance all night and is amazed to meet a guy who can "keep up". Veronica recognises Stefan at the dance and dances with him without revealing her identity. However, emotion finally overcomes her, and she leaves, telling Katherine to take him home. Stefan is left touched and confused, wondering about the mysterious stranger who reminds him so much of his missing wife. Martin is having a ball dancing with the local Melinda, much to Ben's chagrin. Katherine's Melinda decides to intervene and makes sure that Martin says all the wrong things. The local Melinda and Ben finally share the dance he's been waiting for all night. In Katherine's world, Melinda is tired of rules, regulations and the lack of milkshakes. Katherine tells her not to go visiting other worlds, but Melinda defies her and heads to the portal to Ben's World. She is the first to notice a six-pointed symbol near the entrance to the drain. Once there, she is mistaken for the local Melinda by Martin and the local version of her father. 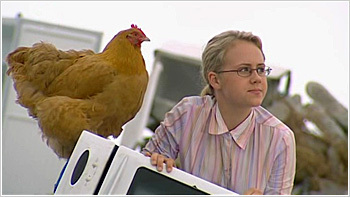 Realising that she is in danger of getting caught out, she runs away when they stop at Mrs Dawes's farm. Hiding in the chook shed Melinda accidentally stumbles through a new portal. Melinda finds herself in a rubbish dump, but unlike the dumps she's used to, this one is filled with near-new electronic gear. Furthermore, Mrs Dawes's missing chook, Florence, is there as well, happily pecking around. However, Melinda can't find the symbol here, and robotic bulldozers keep moving the rubbish around, making it impossible to find the spot she came from. Worried about Melinda, Katherine enlists the help of Francis Thief and Ben to find her friend. After Ben also disappears Katherine and Francis realise that each world has two portals, like a front and back door, and that at least one of the doors is to be found close to each world's Mrs Dawes. They head to the chook shed, find the portal marked by the six-sided Parallax symbol, and go searching for Melinda. They find Melinda and Ben, but the bulldozers keep shifting the rubbish, and none of them can work out where the portal is. To make matters worse, the Welkin arrive. They manage to fend them off, but Ben is bitten in the process. Some new creatures appear on the scene — large, scary, purple scorpion-like things. Luckily, Florence the Chook finds the portal, and the kids run through in time. But not before Francis Thief notices how much loot is lying around for the taking. Francis Thief is quite taken with the hi-tech rubbish dump, and has been taking from it too. He's been pilfering loads of loot, and is keeping it in Ben's world, to avoid having to "share" it in Hippie World. Ben is worried that Veronica is getting wise, and decides to hide the goods in Katherine's world. Unimpressed, Katherine sends it back, leading to much to-and-fro-ing. Katherine is preparing to take the goods back to Ben's world one more time when the local Martin appears, thrilled to have caught Katherine in possession of goods that are illegal in their town. Veronica appears and saves the day, claiming the goods as her own, and thereby legal as she is just a "tourist". Francis Thief is exploring the rubbish dump when he sees the source of the rubbish — a spectacular, ultra-modern city full of people carrying the latest hi-tech gadgets. One in particular catches his eye: Una, a sassy girl with heaps of attitude who is constantly flanked by her cheeky little sister, Due. Unfortunately, Una's boyfriend is the local Martin. Una can't help being interested in Francis though, and they are hanging out together when a furious Martin arrives. He challenges Francis. Martin wins, but neither Francis nor Una could care less. Except for his clothes Francis looks exactly like Francis Short from her own world, but Una knows instinctively that he is stranger from somewhere else. A sinister Spy Kid is watching in the background, unnoticed by the other kids. Veronica and Katherine go to the rubbish dump to return the loot. Katherine takes the blame for the unauthorised trips through the Parallax, covering for Francis Thief. Veronica doesn't believe her story, but Katherine won't come clean and forces Veronica to back off. Katherine and Stefan are in trouble. The local Dunklys are out to repossess their home and, while Stefan is convinced that his upcoming art exhibition will solve their financial troubles, Katherine is worried. She is too proud to ask for Veronica or Ben for help, so Melinda secretly goes instead. Ben is happy to help and they form a plan, but on the way through the portal, he accidentally presses two points on the portal sign, and finds himself somewhere totally new: Forest World. Forest World is an amazing place full of old-growth trees, round modern huts in the forest canopy, steel paths high above the ground and, unfortunately, heaps of giant purple scorpions called Krellicks. Ben is on the run from them when he is helped to safety by Mundi, a red-haired Forester girl. To get back to the portal without getting attacked by Krellicks, she helps him construct stilts. It's a good plan, but unfortunately the Krellicks snap at the stilts with their claws, and Ben is forced to take refuge in a tree. He works out that he can get back home by pressing the points on the portal in the reverse order that he pressed them before but, on the way to the portal, he is scratched by a Krellick. His instincts are correct, however, and he gets home. Veronica comes to Stefan's art exhibition in disguise and passes herself off as a famous American art dealer, convincing the rest of the crowd that the paintings will become very valuable in the future. She buys a piece herself, and the paintings then sell so fast that the exhibition nearly becomes a riot. Katherine doesn't see Veronica at the exhibition, but realises she must have been there, and is torn between annoyance and gratitude. Ben's Krellick scratch means that he is bedridden for a week, and he's not happy about it. He was to be a major participant in the school's beach sports carnival. Katherine visits to grudgingly thank Veronica for turning the art exhibition into a success, and is dismayed to see how sick Ben is. When Veronica announces that there is an antidote (boiled Krellick sting) but that she is too busy to get it, Katherine decides to get it herself. Meanwhile, Francis Thief — now calling himself Francis Zapmeister — has also agreed to get Ben the antidote in exchange for the directions to Forest World. As part of his attempts to impress Una, he agrees to show her and Due the Parallax. They visit Katherine's world, where Melinda learns about Ben's illness. When Francis, Una and Due leave for Forest World, she follows to make sure they get the antidote. Francis Zapmeister, Una, Due and Melinda meet Mundi, who tells them that Krellicks can be killed by squirting them with water. Thinking quickly, Francis gets some water pistols, and they take on the Krellicks on the forest floor. The battle is going well until the water runs out and the Krellicks bring in reinforcements. Katherine arrives, having managed to cut off a Krellick's tail, but she is quickly surrounded by angry Krellicks. Francis runs back for more water. Luckily, Veronica arrives and uses the Stave to fight off the Krellicks, winning the battle. However, she isn't impressed to find Una, Due, Katherine and Melinda running through the Parallax — and she doesn't even know about Francis Zapmeister! She returns home to give Ben the antidote, who is fighting fit in no time. Meanwhile, Francis has scored mega points with Una and Due, who are very excited about the adventures the Parallax has to offer. Veronica sets Ben and Katherine individual quests as an initiation before they can begin training as Guardians. Ben is sent to Desert World, a lifeless place of sand and stone. He marks the portal from which he emerges with rocks, but in doing so, does not realise that the rocks were actually markers for the Parallax symbol. Strolling gung-ho through the landscape, he exhausts his rations and comes across an astonishing sight — a purple ocean. Tired and hungry, he realises he is lost in the middle of nowhere. Katherine is sent to Forest World. Sceptical about the notion of a quest, she is surprised when she finds that there is little going on in Forest World except for a party at Mundi's hut. Katherine doesn't think much of the festivities, dismissing singing and dancing as useless activities of little practical value. However, Mundi eventually convinces her to dance, and Katherine realises there are other parts to life that bring pleasure and benefits in less measurable means. Back in Katherine's world, Melinda has given herself a makeover and goes to Ben's world. However, the only boy who notices is the local Martin, who won't leave her alone, and Melinda spends an awful night trying to avoid him. Ben, meanwhile, is lost, hot, hungry and angry at his mother for dumping him in this dead-end world. However, his survival instincts kick in. He eats the meat of a dead Krellick and uses the shadows of the pinnacles as markers to find his way back to the portal and out of Desert World. At the drain portal in Ben's world, Katherine and Ben meet up and see a bedraggled Melinda heading home to Katherine's world. Ben and Katherine go to see Veronica, who explains that Ben's quest was to teach him to think problems through before acting and not to take things for granted, whereas Katherine's was to teach her to supplement logic and reason with emotions and instinct. A storm is brewing in every world of the Parallax and it seems to bring out the worst in the Martins. In Ben's world, Martin pushes Ben into the surf, even though he knows Ben is terrified of water. Katherine's Martin dumps Stefan's paintings in the mud in another attempt to ruin the Raddic family. In Hippie World, Martin ruins Mrs Short's tie-dyed T-shirts when he steals the tarpaulin that was protecting them from the rain. And in Techno World, Due, who is terrified of storms, is cornered by a jealous Martin, who won't let her go home unless she tells him where Una is and then leaves her alone and frightened as the storm breaks over her. The Martins are lured through the Parallax to Forest World. Ben offers to fight his Martin by the drain and sneakily leads him through the portal. Melinda sings and dances her way through the Parallax, with her Martin hot on her heels hoping to make a citizen's arrest. Francis Zapmeister throws a bucket of water over Hippie Martin, who is only to keen to chase after him. Una and Due, however, don't need to resort to anything of the kind. They simply walk through their portal, with Techno World's Martin jealously following them at what he thinks is a discreet distance. Once they're through the portal, the Martins are enticed into Mundi's hut — together. The four Martins know nothing about the Parallax, and are completely terrified to find themselves facing themselves in quadruplicate. The kids let them out and take them home, telling them they'd been in a very strange hall of mirrors. With no other explanation available, the Martins reluctantly accept the story, but remain suspicious. Techno World is buzzing with the news that the Tangerine Alpha Man, a DJ hologram, is playing at a gig. Una wants Francis Zapmeister to come. Due suggests that he dress in the local Francis's discarded clothes to blend in with the crowd. The Tangerine Alpha Man isn't the only visitor to Techno World today. A mysterious woman dressed in black shows up in a luxury cruiser and is met by the Spy Boy. Spy Boy then hooks up with Francis Zapmeister. Spy Boy takes Francis to meet the mystery woman (Betti). Betti looks almost exactly like Veronica, but Francis, who has never met Veronica, doesn't realise this. Betti offers him a Gemini7 — a prototype video camera — and asks him to film his travels throughout the Parallax so that she can share in the excitement. Ben has his own problems with his own Francis, the surfie. Francis's date from the dance in episode 4, Julia, is back in town, and Francis begs Ben to lure her to the beach so he can impress her with his skill on the waves. The sea, however, is flat as a proverbial pancake, and Ben is stuck stalling Julia until his friend can catch a wave. Katherine isn't having the best day either. Veronica is waiting for her on the bush track to give her an heirloom necklace that belonged to Katherine's grandmother. Katherine refuses to accept the gift but Veronica leaves it there anyway. When Katherine comes to Ben's world to return the necklace she finds a beautiful pink album in Veronica's pottery shed. Looking inside she finds mementos and photos and Katherine realises her mother has been watching over her all along. She puts on the necklace, finds Veronica in the kitchen and mother and daughter finally hug each other. Back in Techno World, Betti tells Francis that she thinks that by removing certain people from certain worlds, a process she calls "blandishing", the Parallax can be a better place. "The problem is the Aberrants," she says, referring to the 8.7% of the population who cause conflict and dissent. The rest of the population live longer, happier and wealthier when the Aberrants have been removed. Betti reveals that she can change the water so that Aberrants who drink the water simply turn into vapour and disappear. Spooked, Francis Zapmeister returns to the outdoor café and orders a drink while he works out how to get out of his date with Una. He hides when he sees Techno World's Francis approaching, dressed identically to him. Then Betti arrives at the café. Mistaking the local Francis for the boy she talked to earlier, Betti apologises for her previous indiscretions and tells him to enjoy his drink. The local Francis obliviously takes a sip, turns into purple water vapour and disappears. Betti, smiling, leaves as a horrified Francis Zapmeister realises "That was meant for me." Francis Zapmeister is in Ben's bedroom, telling him about Betti when Veronica enters. This Francis has never seen Veronica's face before, and he mistakes her for Betti. Terrified, he runs away. Veronica and Ben catch up with him by the drain. Ben explains that Veronica is his mother, and Veronica asks Francis where he last saw Betti. When he tells her it was in Techno World, Veronica is clearly shocked. Betti is so close. She tells the boys that Betti is her twin sister, and orders Francis to go back to his own world and stay there. Veronica and Ben return to the Countrye Inne, where Veronica starts making rushed preparations to go into hiding. Ben doesn't want to go, and asks Jeremy to back him up. More bad news: Jeremy and Veronica admit that Stefan is actually Ben's biological father. Angry and hurt, Ben runs out. Veronica is left to explain to Jeremy that she is also Katherine's mother, that she and her children are Guardians of the Parallax and that her sister is hunting them down, trying to destroy them. Jeremy is upset and bewildered, but tells her he accepts that she and Ben have to leave. Ben goes to Katherine's world and breaks the news to Stefan about the Parallax, telling him that Veronica is alive but has been hiding for all these years, and that Stefan is Ben's real father. In the mean time Francis Zapmeister has returned home to Hippie World and is busy turning his home into a fortress. However, you don't stand a girl like Una up without explaining yourself, and she tracks him down. Francis tells Una about Betti and how she blandished the other Francis. They find Due laughing with the Hippie World locals on the sand. Francis and Una watch, wondering just how much longer they'll be safe in the Parallax. Veronica finds Katherine and takes her to Forest World, telling her that the Welkin and Krellicks are part of Betti's army. The Welkin identify Guardians by tasting their DNA when they bite, and that the Krellicks are sent to destroy Guardians wherever they are found. Katherine realises that Veronica must have just gotten pregnant with Ben when she left, as the combined presence of three Guardians was attracting the Welkins' — and Betti's — attention. They go to the hut that used to belong to the long departed Guardian of Forest World. Veronica explains that apparently the hut is a sanctuary for Guardians, as the Welkin and Krellicks can't sense Katherine, Ben or Veronica when they are there. Veronica returns to Katherine's Werrinup to find Ben. She finds him near the rock crevice portal with Stefan and asks him to come, but he refuses to go with her. Welkin start coming, and Veronica can only fend them off for so long. In the end, she is forced to leave without Ben but pleads with him and Stefan to follow her to Forest World. Stefan convinces Ben that they should follow Veronica to Forest World. Ben finally agrees, and takes Stefan on a tour throughout the Parallax. Stefan is fascinated by the world-hopping, and is particularly taken with Forest World. They arrive at the Guardian's Hut, where everyone is relieved to see everyone else, except for Ben, who can't shake his frosty attitude to Veronica. She tries to explain her actions, but Ben refuses to listen. Even a reality check from Mundi doesn't change his attitude. During the night, when everyone else is asleep, Veronica leaves the hut and goes to Techno World, where she allows herself to be bitten by a Welkin. Meanwhile, Betti is hunting for the new Guardian, whose identity she doesn't know. She visits Hippie World, where she is spotted by Francis Zapmeister, who overcomes his fear of the Parallax to go and warn the others. Then she visits Katherine's World, where Melinda comes up with a clever cover story that sends Betti off in the wrong direction. In Ben's Werrinup, the local Francis goes to warn Jeremy that Betti will be coming. Betti does indeed arrive, and seems to believe Jeremy when he says Veronica has left him and that they have no children. As Betti is leaving, a swarm of Welkin appear, including one that is bright red, having bitten a Guardian. In Forest World, Ben and Katherine are desperate to go and find their mother, but Stefan is adamant that it is too risky to leave the hut and that they must trust Veronica's judgement. Katherine manages to give him the slip, though, and meets up with Melinda, Jeremy and Ben's surfie friend Francis. When she hears about the red Welkin, Katherine realises that Veronica has set herself up as a decoy in Techno World. Ben has come to the same conclusion, and convinces Stefan to come to Techno World to find Veronica. Ben and Stefan arrive in Techno World at the same time as Katherine, just in time to witness Betti leading Veronica towards her cruiser. Betti raises her Stave, which emits a blinding purple flash. By the time it clears, all that Katherine can see is Betti, alone, on her boat. Veronica has disappeared. Ben goes back to his own world and tells Jeremy about Veronica's disappearance. Jeremy encourages him not to give up and Ben leaves with fresh determination to solve the mystery. Unknown to him, however, he is being followed by the air headed local Tiffany, who stumbles through the portal after him and finds herself in Forest World. Ben returns to the Guardian's hut, where Katherine and Mundi have been studying the Stave. Ben thinks they are wasting their time and leaves, but the girls' perseverance pays off when Katherine succeeds in zapping a pesky Welkin. Ben visits Hippie World to ask Francis to help him find Veronica. Still scared of Betti, Francis refuses to go world-hopping, but does tip Ben off about Spy Boy, who he says is Betti's henchman. Techno World's Una has also come to see Francis, and comes up with a way he can make himself useful without leaving his own world. They buy some Gemini7 units in Techno World and have them modified so that they operate on a network, nicknamed Franciscam. The Gemini7s are distributed to Francis Zapmeister, the Francis in Ben's world, the Francis in Forest World and Una, with everyone instructed to keep an eye out for Betti and use the Franciscam network to keep everyone updated. Ben goes to Techno World to find Spy Boy. With some help from Due, Ben finds and follows Spy Boy. Spy Boy has plans of his own: he leads Ben into the rubbish dump and traps him in an abandoned limousine. Ben realises he is in serious trouble when he sees robot bulldozers advancing on the car. Thanks to the Franciscam, Katherine finds out about Ben's travels. She arrives just in time to use the Stave to deactivate the limousine's locking mechanism. Ben escapes from the car just seconds before it is crushed. Katherine uses the Stave to obliterate some prowling Welkin and they escape back to Forest World. Back at the Guardian's Hut, Katherine and Ben agree to work together in future. However, they receive another nasty surprise when the Tiffany from Ben's world pokes her head in and tells everyone that if they don't let her join the "club", she'll tell everyone in the world about the secret forest through the drain! The Tiffany from Ben's world has stumbled into Forest World, and the kids have to come up with a cover story. Katherine's idea of a cover story is to tell Tiffany the truth. Tiffany, of course, thinks that the idea of parallel universes is total nonsense, so Ben tells her that the forest is a secret laboratory for scientists looking for dinosaur bones, which Tiffany believes ("I saw a movie about that once!"). Betti is convinced that Veronica has a son — she knows it was a male Guardian that the welkin bit earlier. She disguises herself as Veronica and goes to Ben's world and at first fools Jeremy into thinking Veronica has returned. The local Francis, however, realises the deception, and Jeremy agrees to keep Betti distracted while Francis, Una and Katherine's Melinda hide any sign in the house that a young boy has lived in the house. Meanwhile, Betti's boat is left empty in Techno World, and Katherine takes advantage of the opportunity to search it. She finds no sign on her mother, but accidentally drops her handkerchief. Due tells her that Betti is in Ben's world pretending to be Veronica, and Katherine, furious, goes to confront her. 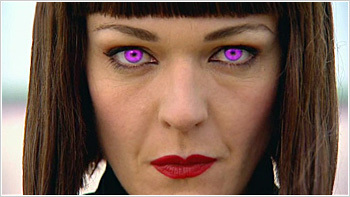 When she gets there, "Veronica's" eyes flash purple, exposing her as Betti. Betti, however, points out that without her to provide Veronica with food and water, Veronica will die. Katherine notices that Betti has her Stave with her, and realises they have no choice but to let her go. As Betti is leaving the house, the local Mrs Dawes shows up, helping perpetrate the lie that Veronica had no children but leaving everyone wondering just how much this batty lady knows. In Forest World, Ben finds a hand-painted egg, which Mundi tells him is the work of the local Mrs Dawes. Ben realises that where there is Mrs Dawes, there is a portal, and Ben and Mundi spot the sign on an outcrop of rocks near Mrs Dawes's hut. When they go to have a look, and Ben notices mounds of odd-looking spherical eggs, which are quickly revealed to belong to some very angry mother Krellicks. Running away from the Krellick nest, Ben finds a Stave lying on the ground, which they believe must have belonged to the previous owner of the hut. Ben decides group action is called for and proposes that Jeremy, Stefan and the Melinda from Katherine's world to come to the Guardian's Hut so that an action plan can be formed to take on Betti. However, when Jeremy and Stefan meet, the tension in the air is so thick you could cut it with a knife. Ben and Katherine fighting over who should be the leader doesn't help matters, especially with the dads taking sides. In the end, Stefan decides that as an adult, he is going to do something constructive, and Jeremy, not to be outdone, insists on accompanying him. They decide to go to Techno World, where Veronica was last sighted, and an exasperated Katherine sends Melinda to keep the bickering "children" under control. Ben, Katherine and Mundi remain at the hut, experimenting with Ben's Stave. Ben tries a new combination of buttons, and suddenly they hear voices. The Stave can act as an intercom. They can hear Betti and Veronica talking! The kids are thrilled to have proof that Veronica is alive, and take note when Betti mentions that they are on an island. Veronica sees the red light glimmering on her sister's Stave, and realises the kids may be listening. She stages a conversation with Betti in which she says that her pots are the centre of her universe — a cryptic clue. Una and Due from Techno World go to visit Francis Zapmeister in Hippie World. The visit doesn't go well, however, with Una catching Francis sharing an ice-cream with the local version of herself. Things get messy — literally — and Francis heads back to Techno World to apologise. However, Techno World's Martin sees him and advises Enforcement Officer Garcia that Francis Short has turned up. Garcia goes to arrest Francis Short for staging his own disappearance. Jeremy, Stefan and Melinda see what's happening, and the dads finally co-operate, backing Policeman Garcia into the river. Una does the same to Martin, to her satisfaction. In Ben's world, Katherine, Melinda and the dads are studying Veronica's pots. They believe the pots are a key to the mysteries of the Parallax, but are having trouble deciphering their meaning. Betti realises someone has been using the Staves to eavesdrop on her. Suspecting that the elusive male Guardian may be listening, she stages a conversation with Veronica in which she announces her plans to send the Krellicks into Techno World. Ben and Mundi hear the threat and rush to rally the troops — and an idiosyncratic array of water pistols. The whole gang arrives to battle the Krellicks — even Francis Zapmeister, who is dressed in drag to avoid raising suspicion. Ben appeals to the local Mr Short, who is in charge of the city infrastructures, for help, telling him he knows what happened to his son (the local Francis, who was blandished in episode 11). The Krellicks march on Techno World. The townspeople flee in terror, and the gang are forced to retreat to the park. They are very exposed and very worried as the Krellicks arrive from all directions. When the Krellicks swarm on the lawn Mr Short turns on the park's water sprinklers, annihilating the Krellicks. The victory is short-lived, however, when a large flock of Welkin attack. The gang try to keep them at bay, but one manages to bite Ben and fly away. Meanwhile, Betti and Spy Boy are at the reservoir, where Spy Boy empties a vial into the town's water supply. With a blast from her Stave, Betti turns the water purple. The now-red Welkin arrives, much to her delight, confirming with its change of colour that the Welkin has found the missing Guardian. The gang are ready to go home when Katherine points out that if Betti could blandish a world by changing the water supply, then why bother with the Krellicks? Its a trap. Suddenly a giant black Welkin, large enough to swallow a person whole, shows up. Katherine realises the Welkin is here to have Ben for lunch, so she forces him to strip off his clothes and give her the Stave. She throws the whole lot into the Welkin's mouth, where is has the intended effect: the Welkin absorbs Ben's DNA, thinks it has eaten the Guardian and flies away. Back at Betti's beach house, the Welkin regurgitates a few clothing remains and a Stave. Betti is convinced that the last male Guardian is dead. Veronica, however, is as horrified as her sister is delighted. Ben and Katherine realise that the lost Guardian of Forest World must have been very powerful to have turned the hut into a sanctuary, and they decide to find him to see if he will help them find Veronica. They decide to find out what lies through the portal Ben saw in the Krellick nest. Using the Stave, they fight their way through the Krellicks and venture into the portal. On the other side, they find themselves in a river, and see a man (Otto) fishing on the bank. He is reluctant to admit it, but they finally manage to convince him to admit that he is the lost Guardian of Forest World. Otto doesn't want to know about the Parallax, but Ben persuades him to help them. At the Krellick nest, Otto uses the Stave to send Krellicks flying, left, right and centre. Ben and Katherine can't help but be impressed. Back home in his hut in Forest World Otto looks with odd satisfaction at his light fittings. Katherine, however, is more concerned with the Stave and eavesdropping on Betti. When she hears Betti taunting and threatening Veronica, Katherine loses control. She speaks into the Stave, announcing that she is Veronica's daughter and that she is coming for Betti. Otto and Ben are appalled, but Katherine points out that Betti will now keep Veronica alive as bait. The trio head to Ben's world to see if Otto can help with the mystery of Veronica's pots. Stefan has sketched a schematic of how they are arranged, and when Otto sees it, he announces that it is a map of the Parallax which shows the way to the Reading Room. The Reading Room? Before he can elaborate, Martin shows up and Ben smuggles Otto upstairs where Otto sees Spy Boy watching him in the bushes. Ben leaves Otto for a moment and when he returns all that's left is Otto's Stave and a note. Their best hope for finding Veronica has vanished. Ben and Katherine form a plan. Since Betti is on the prowl for Katherine and thinks Ben is dead, Ben will go looking for Otto and Katherine will remain in the Guardian's hut and monitor the Stave. Francis Zapmeister also has a mission — to interrogate the various Mrs Daweses about the Reading Room. In Techno World, things have changed. A town meeting is being held, led by Mrs Dunkly and Enforcement Officer Garcia, extolling the virtues of the new, more peaceful Werrinup. A few voices ask why so many citizens have disappeared, but nobody really cares to listen. Moving through the crowd at the meeting is Otto, who is being stalked by Spy Boy. Una spreads the word via the Franciscam and Ben arrives shortly after. He loses sight of Otto when the townspeople recognise him as the hero who conquered the Krellicks and drag him up on stage. Ben eventually manages to track Otto down, where Otto explains that he'd seen Spy Boy outside Ben's house and decided to lead him away' He came to the blandished Techno World figuring Betti wouldn't look for him here. Before Ben can ask about the Reading Room, Otto heads off, leaving Ben with a cryptic clue about where they can meet later. Betti contacts Katherine, eager to get her niece onside. Betti outlines her plans for creating peaceful, harmonious worlds, and for a moment Katherine believes that Betti may have a logical plan and that her ideas may have some merit. Melinda quickly points out that Betti's ideas would lead to the death of individuality in the Parallax and Katherine denies she faltered. When Betti calls again Katherine demands to talk to Veronica. Katherine, choosing her words carefully, manages to convey to her mother that Ben is alive and that they are working on the message in her pots. Fortunately, Betti doesn't realise what has been said. Stefan and Jeremy, misinterpreting the hidden mysteries of Veronica's pots, believe they have the answer to the Reading Room and set off through the portal for Forest World. But they get it wrong and find themselves in Desert World. To make matters worse Tiffany has followed them. The two dads split up to explore the bleak terrain. Stefan comes upon a luxurious tent, standing freakishly in the wilderness and occupied by Betti, who has left Veronica stranded on the island in favour of a bizarre solo vacation. Stefan is cagey with her but Tiffany, who's been tagging along, mistakes her for Veronica and blabs about Ben being her son. Katherine and Ben, alerted to the dads' misguided expedition, follow them through to Desert World. Ben, finding Jeremy lost and despondent by the purple ocean, gives his adopted dad both advice and directions. Betti, eager for more information, is holding Stefan and Tiffany when Katherine finds them. Seeing a Stave in her hand Betti recognises her as the young female Guardian — Veronica's daughter. As each have a Stave it is a stand-off until Tiffany throws sand in Betti's face, giving everyone time for a getaway. Katherine, Tiffany, Stefan and Jeremy make it through the portal. Betti arrives too late to stop them or discover which world they came from. But now she knows Katherine's name and Ben's identity and that Stefan is Katherine's father. Her net is closing in on the kids. The Martin of Katherine's World, discovering the connecting portal, meets the Martin of Ben's World. Realising they're versions of the same person, these two schemers put one and one together and start guessing at the existence of the Parallax and how they could turn it to their advantage. When our team returns from Desert World the two Martins are waiting for them. Together. And they want answers. The two Martins, Ben's and Katherine's, confront our heroes with their discovery of different worlds. They want to know everything and be included in the gang from now on. When Katherine and Ben refuse, the Martins put pressure on Tiffany, but she proves more a nuisance than a help. While the Martins try to rip off both their worlds Betti has been watching. She approaches Katherine's Martin — the greediest — and, having shown him the riches of Techno World, gets from him the information she most wants — where Katherine lives. Ben and Katherine return to Forest World and take stock of the situation. They must find the Reading Room — the font of all knowledge of the Parallax, including surely the whereabouts of Veronica. But so far their mother's pots have failed to yield up any clues regarding its actual location. Suddenly Mundi, who's been quietly listening in the Guardian's Hut, prompts them to some lateral thinking. Veronica has been prisoner on an island, right? Which is why Betti whisked her away from Techno World on a boat. Yet both the portals in that world are on dry land. Therefore, Ben realises triumphantly, the island must be off the coast of Techno World itself. That narrows the field. Locating the only island within range they sail there — a hair-raising trip for the water-dreading Ben. They find the island and the beach house deserted. But they do discover Veronica's wedding ring, proof that she's been there. On the beach Ben gets a call from Betti on the Stave. Thinking she's talking to Katherine, her aunt demands a meeting immediately. Or else… And it is clear that Betti has not only found Katherine's World: she is standing in Katherine's bedroom. Note: in this episode the kids travel to Circe Island, a nod to creator/producer Paul Barron's 1990s kids show Ship to Shore which was set on Circe Island. Igor Sas (Stefan) and Francoise Sas (Melinda) both appeared in Ship to Shore. In Ben's World, after Francis saves Melinda in the surf, a junior life-saving club is mooted to prevent more accidents. Francis and the local Martin are both nominated for president and a triathlon is held to decide the winning candidate. The Martin of Katherine's world suggests to his second self that, by doubling in the race, they'd beat Francis hands down. Francis Zapmeister, passing through, overhears the scam and suggests that he and the local Francis play the same game. But our local surf hero refuses to cheat and it looks as though the devious Martins will win the day — except that Tiffany, for all her silliness, doesn't like cheating either. She warns the Martins that, if they do, she'll blow wide open their secret knowledge of the Parallax. Betti demands a meeting with Katherine. Since her Guardian aunt still holds her mother prisoner, and since Betti has found her way to Katherine's own house where Stefan is in imminent danger, Katherine has no choice but to agree. Betti introduces her niece to Garden World, an immaculate parkscape where the residents are in a state of almost happy contentment. This, says Betti, is an example of a fully blandished world. Why even the local Martin is benignly playing the violin — for free! Part of Katherine has to admit that this is not the zombie-like or dictator-controlled society she had expected. But she soon sees that it comes at a cost nonetheless. Guardians who disagree are 'removed' and even worlds destroyed as happened to Otto's World which is now the wastes of Desert World. Whoever is outside the norm in any world simply disappears. This can even include a Martin. For example the not-so-bad Martin who lives in Mundi's Forest World would go when the world is blandished. As much as the Martins are a pain, Katherine realises that a world without them is bland and that even a Martin deserves to live. Betti urges Katherine to share her vision for the Parallax and join her. Katherine returns to the Guardian hut with twenty-four hours to think it over. She tells Ben there's no way she'd ever join her deluded aunt. But now Betti will come for her — it's only a matter of time. Katherine urges Ben to leave Forest World. She knows Betti will track her down sooner or later and figures that Ben is their best chance of finding Veronica. Not only is Betti focussed on finding Katherine but Betti also believes that Ben was eaten by the Mother Welkin and won't be looking for him. Betti is indeed on the trail, and now she has lackeys. She has recruited the Martins from Ben's world, Katherine's world, Techno World and, most recently, Forest World to be her own personal pursuit team to find Katherine. All the Martins are keen to prove their loyalty, except for Forest World Martin who lies and says that he's never seen Katherine before. Since he rather likes Katherine, he doesn't want to give her away. Betti is suspicious, but loses interest momentarily when Techno World Martin says that Ben returned to his world after the Krellick battle. Betti realises that she's been fooled. She returns to Techno World with its Martin to confirm the story. While Betti is gone, the other two Martins try to interrogate the Forest World Martin, who they're convinced knows more than he's letting on. Katherine's Martin, snooping through Betti's possessions, finds her Stave. Experimenting with its functions he manages to make a mess of Betti's luxury interior but he doesn't realise that he has also activated the intercom function and Ben and Katherine overhear him reveal that Betti has found out that Ben is alive. When Betti arrives and sees the state of her house, Ben's Martin and Katherine's Martin place the blame on Forest World Martin. She sends them out to track down Ben and Katherine. Katherine's Martin convinces Forest World Martin to avoid upsetting Betti further by telling what he knows. Forest World Martin is so traumatised that he tells the truth. Katherine's Martin passes it onto Betti who is very pleased: she knows what to do. In Forest World, Ben notices an unusual hexagonal mark on the rug, and Mundi is reminded that when Otto lived in the hut, a wooden pedestal stood there with a glass object on top. Remembering that the local Mrs Dawes is a great fan of Otto, they pay her a visit and find that she has the pedestal in her hut for "safekeeping". She mentions that Otto used it to hold his "Orb", and Ben manages to sweet-talk her into letting them borrow the pedestal. Back in the hut, they realise that one of Otto's lights, which has never worked, isn't a light at all. It fits exactly on the pedestal. When Ben and Katherine touch it, it starts to glow, and reveals to them the images of a different Werrinup, with just one inhabitant — Otto, running through the streets, clutching the Orb. They then see a purple firestorm obliterate the world, leaving nothing but sand and stone pinnacles. They realise that the Orb is a record of Otto's world, which Betti must have destroyed and turned into Desert World. They are interrupted, however, by Forest World Martin, who bursts in, admitting that he gave them away and urging them to leave. They take the Orb and run for it. Betti walks in moments later, and is most displeased to have been led on another wild goose chase. Ben takes Katherine back to his world, telling her they can hide out in Francis' surf shed. They have Otto's Orb, which makes the shed a sanctuary. Experimenting with the Orb, they realise it only functions when both Ben and Katherine are touching it. This makes sense, since both Ben and Katherine have 50% Guardian blood, so combined they are the same as one full-strength Guardian. However, all they can get the Orb to do is replay the history of Otto's World. Katherine is sure there is more to the Orb than this. Meanwhile, Francis the Surfer is diving down at Madfish Rocks, when he sees something round and shiny underwater. Terrified, he surfaces and runs away. Katherine's Melinda collects Stefan's sculpture, a 3D representation of the pots. Katherine is convinced that between the Orb and the pots they will work out how to get to the Reading Room. Bringing the sculpture to the surf shed, Melinda spots a hexagonal pattern. This triggers an idea in Katherine, who realises that the worlds of the Parallax may be linked like hexagons in a row, instead of just in a straight line. After all, the portal symbols have six points. They are interrupted by Surfer Francis, who starts to run away as soon as he sees the Orb. He tells them about what he experienced underwater at Madfish Rocks, and Ben and Katherine realise that there could be another Orb there. 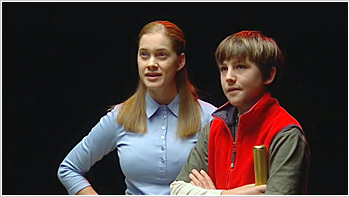 In order to investigate, both Ben and Katherine will have to touch it, and this means that Ben will have to dive underwater. Summoning all his courage, Ben dives underwater, hand in hand with Katherine. Veronica is trapped in Betti's serene Garden World, inquiring after the local Mrs Dawes. Nobody seems to know anything about her, and Betti confirms this, telling Veronica that the old woman was made quite redundant in a world where portals are unnecessary. Ben and Katherine find the sunken Orb, touch it, and are immediately transported to a black void. Towering above them is the huge ring of the Parallax and the lights of each of the worlds. But there are no books, no papers — nothing to read. Ben's Stave has turned gold and they discover that by pointing it at the coloured lights, the corresponding world appears in the symbol, showing images of its past and present. Katherine discovers how to control and 'read' the histories and presents of the worlds by viewing them. They realise that the Orbs both collect information and send it to the Reading Room while acting as a gateway portal that can only be activated by a 'full' Guardian. Looking through the various worlds, they come across one marked by a mauve light. It is Betti's Garden World and in it they see Veronica. They have found their mother at last. Ben and Katherine return to Melinda and Francis and start debating how to rescue Veronica. Francis points out that neither Ben nor Katherine can go as they would fall into Betti's trap. When he volunteers to go Ben is amazed — his best friend has never ventured through a portal. In fact, the idea of the Parallax has always freaked him out! But Francis is adamant. If Ben can face his fears, so can he. He'll go into the Parallax and bring back their mum. Francis Surfer is preparing to go to Garden World to rescue Veronica. Ben and Katherine travel to the Reading Room to watch his progress as Melinda leads Francis through the Worlds to the skyscraper portal in Techno World. Francis goes through safely and emerges in Garden World. He starts searching for Veronica. In the meantime Betti has tracked down the Martin from Katherine's World. He doesn't want anything more to do with Betti after her anger back in Forest World, but is too terrified of her to refuse. She takes him to Garden World and shows him the portals. One is near a metal grille doorway, the other is through the fork of a tree. Betti is convinced that Ben and Katherine will come through the portals looking for Veronica and intends to capture them. Betti assigns Martin the tree-fork portal and loans him a Stave, telling him to use it to contact her should Ben or Katherine arrive. Francis finds Veronica but in the Reading Room Ben and Katherine see the danger. With Betti and Martin guarding the portals the kids try and work out how they can get into Garden World. Then their attention is caught by two clowns who are entertaining the picnickers. Katherine recognises the voice of one clown as Otto, their Guardian friend, and is puzzled why he is in Betti's favourite world. Ben presses a button on his Stave and some new lights appear on the Parallax symbol. He realises that there is not one line of worlds, but two — like the two strands of a double helix. And where they meet the worlds might not just a 'front door' and a 'back door', but also a 'side door' — a third portal! They return to Ben's World and consult the local Mrs Dawes, who refers them to her brother, Henry Dawes, keeper of the Side Doors. Henry shows them the portal but warns them it's a one-way trip. When they find the clowns Otto explains he is hiding in Garden World because, since there are no aberrants left in this world, it's the last place Betti would expect to find him. 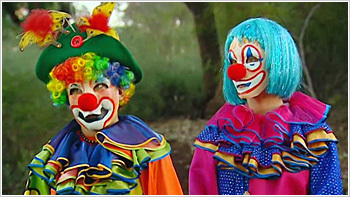 Ben and Katherine also disguise themselves as clowns and track down Veronica and Francis. They head for the tree-fork portal and separate Martin from his Stave, escaping through the portal. Before they go, Ben discovers that Otto's sidekick clown is Spy Boy, who is now siding with the heroes. They escape through the portal, leaving Martin to face Betti's wrath once again. Back in Ben's world, Jeremy rushes out of the Countrye Inne to greet Veronica, and everyone is pleased to be reunited. However, the joy is short-lived when a purple fireball bursts down from the sky. The Countrye Inne explodes, debris flying everywhere. As the smoke clears, the heroes see Veronica lying unconscious on the ground. The unconscious Veronica is taken to the surf shed sanctuary to recover and Ben and Katherine head for the Reading Room intending to sort Betti out once and for all. They call up images of the various worlds searching for her and Ben notices a new one which they nickname Swamp World. Ben accidentally steps into the Parallax symbol and is transported to Swamp World. He finds the world's Orb nearby but can't activate it without Katherine. Appealing to her for help, she comes to Swamp World, and together they touch the Orb and return to the Reading Room. They now have "Ben and Katherine" doors — using the Orbs of the worlds to get to and from the Reading Room. Betti makes contact on the Stave. Betti doesn't realise that Katherine is in the Reading Room and able to see her in her luxury tent in Desert World. Katherine agrees to be taken to a "secret destination" for a meeting. Katherine asks Ben to come up with a plan to save everything. They both know that the situation is critical. Katherine is lead by Martin to Betti via a new portal — one that happens to be right in the corner of Betti's tent. Betti receives her niece and offers her proof that they are alike. She presents three glasses of purple liquid and says that if the three of them drink, and Betti and Katherine are alike, Martin will be blandished. If Betti and Martin are the average however, Katherine will disappear. And if they do not drink, they will die of thirst. Martin, terrified, runs from the tent. Katherine refuses to drink the liquid. 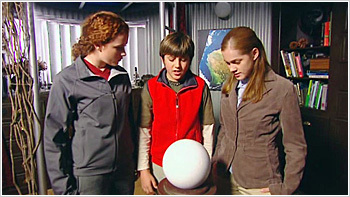 Watching all this, Ben realises that they can use Ottos's Orb to trick Betti — it is originally from this world. If they return the Orb to its world, they will be able to use it to escape. Ben returns to the surf shed and assembles the troops, telling them to bring brooms. 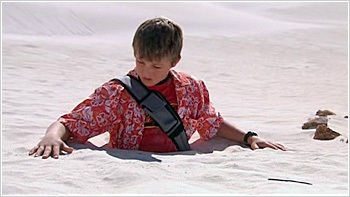 Ben and Francis enter Desert World through the dune portal and scatter the rocks that formed the portal symbol and trick Betti away from the tent. While Betti is on the wild goose chase the gang move the tent and use the brooms to wipe away their footprints. When Betti returns she believes that she has trapped Ben and Katherine. But the kids find the Orb, hidden as planned under some cushions. They touch it, transporting themselves to the Reading Room. Betti furiously heads for her portal but is stunned when she simply runs into the corner of her tent! She realises the tent has been moved, and is angrier than ever before. Katherine and Ben are triumphant, until they realise that Katherine's Martin is still trapped in Desert World. Katherine doesn't want him to be left there. They return and manage to get him safely through the dune portal. But as they're about to leave Ben discovers that he has lost his Stave. Betti appears, holding two Staves, Ben's and her own, and the young Guardians realise they are now officially in deep do-do. Betti demands that the two siblings take her to the Reading Room, as she isn't a potent enough Guardian to get there on her own, or even with one of the two. Katherine agrees, and out some drinks. Betti forbids them to drink it but has a sip herself. And turns into purple vapour and disappears. Katherine explains to Ben that Betti didn't realise that Martin had left Desert World, and therefore didn't realise that out of Ben, Katherine and herself, she (Betti) was actually the aberrant. In Desert World, a cloud of purple mist appears, forming a smiling, undefeated and all too familiar figure. Betti.